Handcrafted. Made in Maine by local artists. 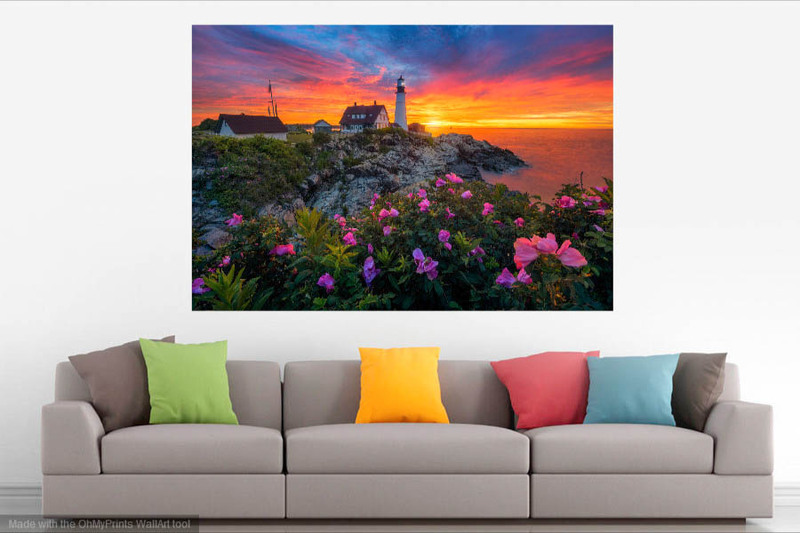 Our Fine-Art prints are made in house in Scarborough, Maine. We choose to oversee every part of the production process to ensure that only the highest quality products make it onto your wall. We are also able to cut out the middle man that is so commonly present in print production and mounting. This allows us to offer the absolute highest quality prints at prices only we can offer. Our prints are created with the highest quality printers, inks, and papers. Prints are produced on Inkjet media at an extremely high resolution. Color and tonal accuracy is paramount, so all monitors and printers are calibrated with custom ICC profiles. This ensures the absolute highest quality reproduction of the piece of work. Our Diamond Acrylic Prints are named because of how they look. They become the crown jewel of the house, captivating everyone who catches a glimpse. They radiate light as if they are backit, but maintain detail and clarity like that found in a high end inkjet print. Unlike metal prints, they have heft and volume which provides a profound presence on the wall. This is the absolute best presentation method for wall mounted photographs. This look is achieved due to our proprietary printing and mounting processes. The printing substrate is infused with iridium particles that reflect light, creating incredible luminescence in the images bright areas. Bright areas of an image glow, providing dimension and definition that is usually lost on typical lustre paper. The print is face-mounted to an optically clear piece of acrylic which amplifies the depth and dimension of the iridium print. Light scatters when it hits he acrylic, creating an incredible and lifelike glow. These prints jump off the wall! All Diamond Acrylic prints come with a 1/8" Komatex backer and 3/4" float mount hanging hardware. These prints are 100% ready to hang upon delivery! They start at 16x24" and can reach 36x54". Special panoramic sizing is available. Interested in a custom size for a specific wall? Contact us for a free consultation! Canvas Gallery Wraps are one of the best ways to present photographs on the wall. The are absolutely stunning, low glare, high detail, affordable, and ready to hang. Our gallery wraps are printed at a high DPI, use thick high quality canvas, and are reinforced with heavy duty stretcher bars. An optional varnish is available to increase depth and definition of the print. All inks and canvases are archival, allowing for stunning wall art that will last for a lifetime. We do all canvas printing and stretching in house in order to pass the savings along to you. The more you can put on your wall with your budget, the happier we are! Canvas sizes range from 16x24" up to 36x54"! We can also produce special panoramic sizes for odd wall spaces.